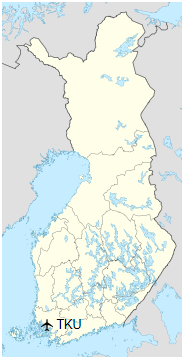 Turku Airport (IATA: TKU, ICAO: EFTU), is located in Turku, Finland, 8 kilometres (5.0 mi) north of the centre, in Lentokenttä (Finnish for airfield; Swedish: Flygfältet) district in the Maaria-Paattinen ward of Turku. It serves approximately 320,000 passengers per year, being the fourth busiest airport in Finland by the number of passengers (in 2012) and second busiest airport by the amount of cargo tonnes (in 2012). Turku Airport is exclusively operated by the state-owned company Finavia. Among normal operation the airport offers differentiated service specifically designed for low-cost airlines since 2008. Turku Airport and its surroundings are marketed as LogiCity in hopes to attract logistic companies and manufacturers near the airport. Turku Airport was Finland’s first civilian airport when it was built in Artukainen in 1935, but already in the 1920s there was a water airport on Ruissalo Island. Artukainen served as a main airport of Turku until the new airport was built in the municipality of Rusko in 1955. The location become part of Turku in 1957. New terminal building was opened in 1978. Runway was upgraded to 2500 m in 1980. Air cargo terminal was opened in 1991 as well as air cargo plate. Terminal 1 was renovated and enlarged in 1999. In the 1990s, Lufthansa CityLine operated flights to Hamburg and ELK Airways to Tallinn. 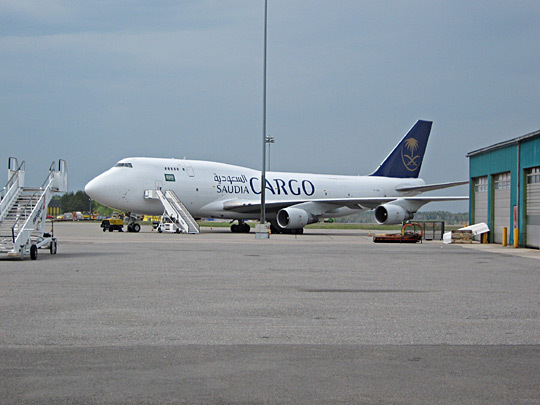 Second cargo terminal was opened in 2003 and second passenger terminal for low-cost airlines in 2008. 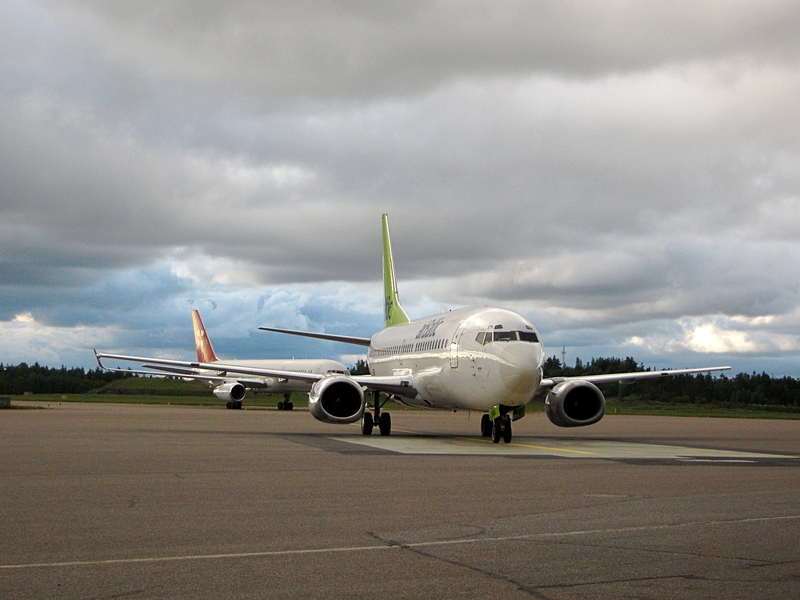 Wizz Airlaunched flights to Turku in April 2008 and AirBaltic in July 2009. 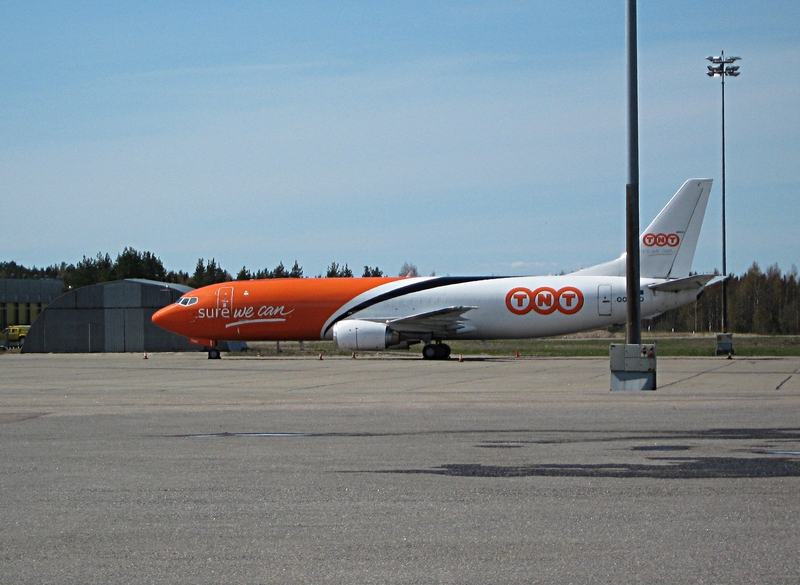 Wingo xprs operated flights to Stockholm-Bromma in spring 2009 and Jet Air to Gdańsk in 2009–2010. Norwegian Air Shuttle flew to Stockholm-Arlanda and Flybe Nordic to Tallinn during the winter season 2011–2012. Ryanair operated flights to Brussels-Charleroi, London-Stansted, Málaga and Barcelona-Girona only during the summer season 2012. According to Ryanair the period was very successful but they could not tolerate the raised airport costs of Finavia operated airport and promised to return all routes as soon as price raise would be withdrawn. During the Ryanair’s stay there was 27% growth on passenger statistics. 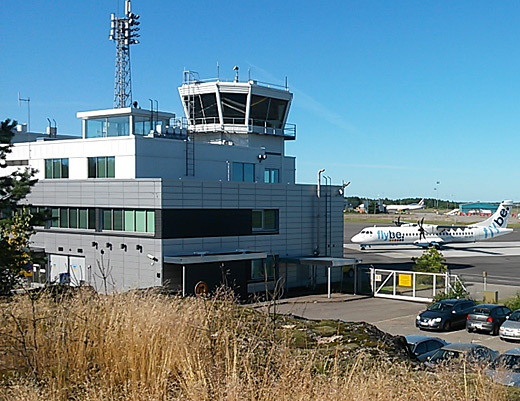 Turku Airport was closed partially in July 2014 for the renovations of the runway and taxiways. Terminal 1 and the passenger apron were also renovated. Finavia budgeted 14 million euros for the renovations and improvements. However, Scandinavian Airlines flights to Copenhagen, one of the most important destinations operated since 2006, were discontinued after the renovations. This had immediate impact in passenger volumes. Terminal 2 was closed and its passenger services migrated to the main terminal due to oil leakage clean up of a spare power unit in autumn 2014. In June 2015 Finavia announced that the low-cost terminal will be completely demolished and low-cost concept will be continued in the first floor of main terminal in new premises. Logicity started as a project of Pilot Turku Ltd (founded in 2003) but now operated by Turku Municipal Property Corporation after the contract with Pilot Turku Ltd ended 2010. Logicity will be a logistic hub built around Turku Airport. Logicity is supposed to link the different modes of transportation together. Location is considered ideal due to facts that Turku Airport is just in 20 minutes reach by sea ports of Turku and Naantali which combined values are comparable to the Port of Vuosaari in Helsinki, Both E18 highway to St. Petersburg and E63 to Tampere go via Turku Airport, and also rail transport connection to Russia and China passes by Logicity area. Pilot Turku describers Turku Region as «the meeting point of the East, the West and the Nordic countries» and as «the multimodal transport centre of the Nordic Triangle». Logicity is estimated to create at least 3,000 to 5,000 new jobs. The length of the runway at Turku airport has an option to be upgraded to reach 3,300 m (10,827 ft) to meet new demands. There are several plans set for the nearby area: new roads, commercial centres, retail parks, industrial estates, logistic terminals and offices. In fact there is already big commercial area along with the E18 ring road just few kilometers from the airport. Logicity is planned in two phases which of phase one allows now to build 400,000 m2 (4,305,564 sq ft) of floorspace and second phase will increase it to 1,000,000 m2 (11,000,000 sq ft). Project is regionally important and many towns near the airport including Turku were involved in project as shareholders of Pilot Turku Ltd e.g. Kaarina, Lieto and Naantali. Currently in 2015, there are three zoning plans pending in Logicity area: northern side of the runway, railway sites on the east and industrial zones near the railway. ASL Airlines Belgium operates daily cargo flights, however many other less frequently sighted air cargo companies also visit Turku, such as Ukraine Air Alliance or Ruby Star.